What's It Like to Golf With the President? President Barack Obama practices his golf swing at an outdoor hold prior to an event in Los Angeles, California in 2009. Golf isn't about sticking your approach shot in front of the most powerful man in the world. It's about casual conversation. When Dustin Johnson missed that four-footer on the final hole in this year's U.S. Open that would've forced a playoff with eventual champion Jordan Spieth, he wasn't under this much pressure. Joe Courtney, the mild-mannered Connecticut Congressman, had scored a spot in a weekend foursome with fellow House Democrats John Yarmuth of Kentucky, Ed Perlmutter of Colorado, and the most famous lefty golfer this side of Phil Mickleson, President Barack Obama. Even better, Courtney was Obama's teammate, standing over a putt that would've won him and his new golf buddy a $3.00 bet. "I left it on the lip," Courtney told me on WNPR's Where We Live. "If I had knocked it in, we would have shut the door on those guys. That one, I'll never forget." The outing was the result of Perlmutter, Courtney's roommate in a D.C. apartment, dogging Obama about getting out onto the course with some rank-and-file members of the House Democratic Caucus. "Ed's district is a swing district in a swing state, and Ed's a very persistent guy, and has been sort of hounding him," Courtney said. The call came two weeks ago from the White House, and they teed off at around 11:00 am on Sunday at the golf course at Andrews Air Force Base. 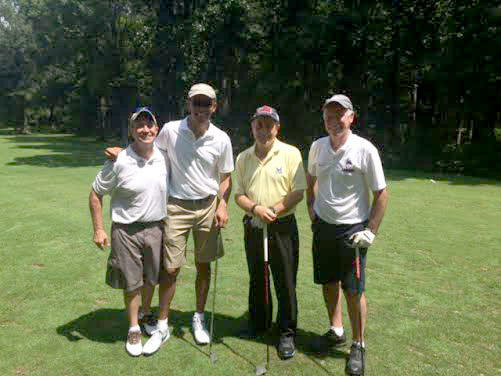 Just another day at the golf course with President Barack Obama alongside Democratic House Reps. Joe Courtney of Connecticut, Ed Perlmutter of Colorado, and John Yarmuth of Kentucky. Courtney said he and Obama, who "has clearly got the bug," were paired up and got strokes from Perlmutter and Yarmuth, the ringer of the group. A 2011 Golf Digest Ranking of Washington's Top 150 Golfers had Yarmuth ranked number 14, with a three handicap. Courtney said he's about a "12," which would have ranked him about halfway down the list. But he wasn't on it. In fact, I didn't even know he was a golfer. He keeps it a secret, unlike his support for his district's big industry. "Like submarines," Courtney told me, "run silent, run deep." But as anyone who has played a lazy Sunday round knows, golf really isn't about leaving a putt short, or sticking your approach shot in front of the most powerful man in the world. It's about casual conversation. "We just talked about golf, family, sports and social media," Perlmutter told The Denver Post. Courtney confirmed the patter was light. "I know in this world of 'House of Cards,' the view of Congress -- people think everything is transactional, and nothing is innocent," he said. 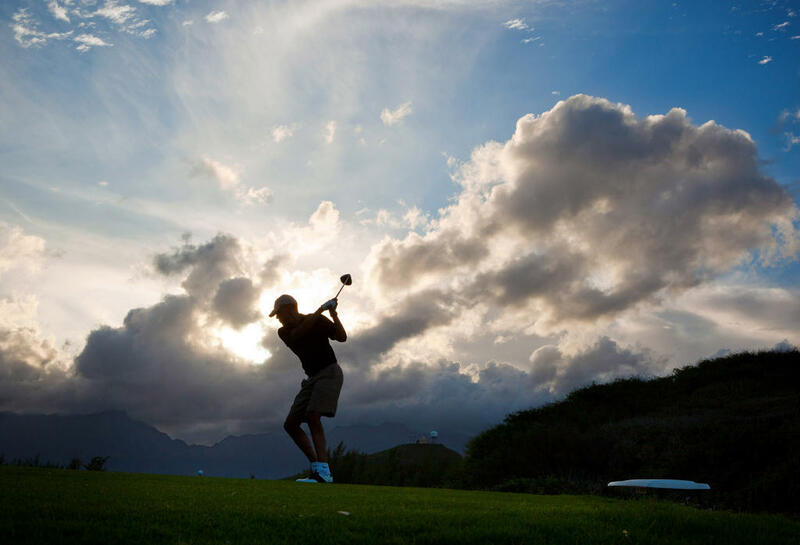 President Barack Obama golfs in 2010 in Hawaii. What about the pressing issue of the day, whether these Democrats would support Obama's nuclear deal with Iran? Perlmutter told the Post "it wasn't part" of their conversations, something Courtney confirmed. Of course, that didn't stop the Washington rumor mill, which churned out stories about the three being alternately "thanked" and "lobbied" by Obama for their vote. And of course, in Washington, there's always politics involved, even in the pairings on a golf course. Courtney called the whole thing "exciting." And about that putt: was he worried about his presidential partner's reaction? Not really. He had more pressing concerns. "I had to pay my roommate three dollars," he said. "Which I'll never hear the end of." HOST JOHN DANKOSKY: Joe Courtney, welcome back to Where We Live, thanks so much for being here. CONGRESSMAN JOE COURTNEY: Thanks John; it’s been a while. DANKOSKY: The big news for us this week is: you played golf with President Barack Obama? COURTNEY: I did. On Sunday at Andrews Air Force Base, myself and two of my buddies from house -- John Yarmuth from Kentucky, and Ed Perlmutter, who actually I room up with in DC -- you know, had a pretty exciting opportunity to spend over four hours out on the course with the president. DANKOSKY: Wow, so how did this opportunity come about? What happened? Did you get a call from his people and say, wanna play golf this afternoon, or was this planned for a long time? COURTNEY: It actually has been in the works for a long time. Ed, my roommate, has actually spent quite a bit of time campaigning with him out in Colorado, which in ‘08 and ‘12 were swing states. Ed’s district is a swing district in a swing state, and Ed’s a very persistent guy, and has been sorta hounding him to say, you really need to get out and play with some of the sort of rank and file house members. The call came about two weeks ago from the White House saying the president was inviting us out.. and we met him, and teed off around 11:00 or 11:15 Sunday, and finished up about 3:30. COURTNEY: I’ve done a pretty good job keeping that secret… yeah, like submarines: run silent, run deep. Actually, my dad started me young and you know this job is not really the most conducive in terms of the chunks of time. But a bunch of us get out and play, sort of dawn patrol, a municipal course, down in D.C. Langston, and try to squeeze in nine holes here and there. When I’m home, there are a couple places I try to get out and play with some friends: Twin Hills out in Coventry; Skungamaug in Tolland; I’ve played Pocotopaug not to long ago. In any case, I love the game, and it was a great time. I’ll tell you, this guy who started golf late in life -- I think the news reports have all talked about he has clearly got the bug. He was just great company. We had a two-ball match combined. I was teamed up with the president, with the other two on the other side. We got some strokes initially -- John Yarmuth is a three from Kentucky, but we actually rolled up a pretty good lead pretty early, and gave back the strokes on the back nine. As a match, we closed them out about 14th or 15th hole, but they pressed and they won the press. I had to pay my roommate three dollars, which I’ll never hear the end of. DANKOSKY: So what’s your handicap? COURTNEY: I’m about a 12. DANKOSKY: You’re about a 12 -- so you are a pretty good golfer. You are a better golfer than the president, probably. COURTNEY: A little bit, I’ll tell you his game, for someone, again, who started late in life… he plays steady and frankly peoples rounds matched up to their handicaps. It was a lot of fun, it was a match that everybody waas engaged in till the last putt. DANKOSKY: I just have to ask you one last golf question. You’re standing over a putt that’s maybe worth three dollars, but your teammate is the president, does this put extra pressure on you? Are you stepping up thinking, I kinda have to make this put the president is my team mate? COURTNEY: You know, I played well, I was very happy, but I will confess and the press on the 18th hole that I left it on the lip. Which if I had knocked it in we would have shut the door on those guys… that one I’ll never forget. DANKOSKY: Moving on to the business piece of this, we read some reports about what was discussed. Whenever you see the president go out and play golf with people, famously he has played with John Boehner in the past, and you know what sort of deals are they going to strike. One thought is: if he is going to go out with a group of House Democrats -- what do you think about this Iran deal? I mean, you guys are going to have to eyeball this and take a look at it, so did you talk about Iran at all? COURTNEY: We did not. I know in this world of “House of Cards,” the view of Congress, people think everything is transactional, and nothing is innocent. But I will tell you it was a very normal interaction. I had never played Andrews, so it was a dog leg left, dog leg right, is the pin up, is the pin back, where is the wind. You know, we talked about family -- he had just come back from New York City, where he and his daughters went out to see the new hip hop musical “Hamilton,” which he gave positive reviews. Again, it was just very normal. I mentioned the fact that the First Lady is coming up to Groton for the christening of the U.S.S. Illinois, which we are very excited about. And at the end, when we were saying goodbye, he mentioned it -- I didn’t bring it up, but I really didn’t want to, I didn't want this to be brought into what was really just a promise he made to Ed [to go golfing] over a year ago. But clearly, this is the issue of the day this week. I’m getting on a plane in a few minutes, as you and I discussed, and Senator Kerry’s coming over to do a classified bipartisan briefing tomorrow along with Secretary Moniz. You know, I’m still studying this agreement, I got my dogeared copy here with me right now, which we have been going over. Armed services community, which i serve on, as you know, we have been talking about this issue for months now and it’s a lot to sort of absorb but again around of golf was not the place to do it. Ana Geismar contributed to this report. All eyes are on Congress as lawmakers debate the Iran nuclear agreement. This hour, we speak with Connecticut's 2nd district Rep. Joe Courtney. He called the tentative deal a "hopeful development" when it was first announced. Connecticut Congressman Joe Courtney joins a classified bipartisan briefing today on the Iran nuclear deal.